Looming high over the Austrian capital of Vienna, the St. Stephen's Cathedral is both a symbol of the current-day city and proof of its centuries-long history. Hundreds of years before the powerful Habsburg Empire reconstructed the city in their own image, St. Stephen's already dominated the horizon. With its four beautiful, imposing towers and distinctive tiled rooftops, the Cathedral is a breathtaking sight to behold. No wonder it's routinely cited in guidebooks as one of the top attractions to see in Vienna, especially on a first trip. Since this is among the tallest religious structures in the world, climbing the South Tower's more than 300 steps to the top also affords fantastic panoramic views of the whole city—definitely a must if you're willing and able. It would be a mistake to view this masterpiece of Romanesque and Gothic architecture as somehow frozen in time. In reality, it has evolved over many centuries along with the city itself, renovated and expanded at numerous junctures in history. The edifice we see today was first constructed during the 12th century and commissioned by Leopold IV. 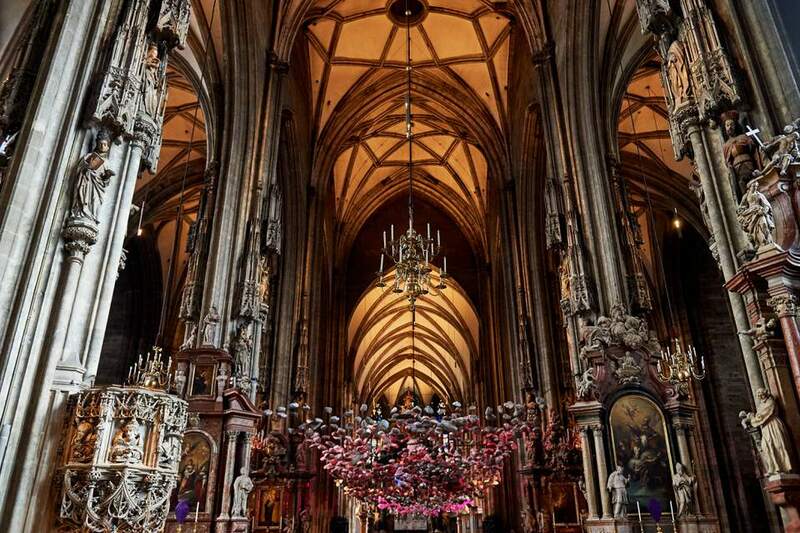 Built to recognize the growing importance of Vienna as a center of religious worship as well as trade, the medieval construction was superimposed on the ruins of two earlier churches. This included a parish church and an even older one believed to date as far back as the 5th century. Archaeological evidence also suggests that a large Roman-era cemetery lies underneath the Cathedral; digs here have revealed graves that were apparently created during the 4th century. The initial, mostly Romanesque-style church was initially completed in 1160, but expansion and renovations were all but constant through the 17th century. Romanesque towers and walls were built during the early 13th century, and part of that construction remains to this day. The Great Fire and Reconsecration: A massive fire gutted and largely destroyed St. Stephen's during the mid-13th century, leading to an overhaul of the existing structure that included surviving towers. There was a new consecration in April 1263, and this occasion is commemorated every year through the ringing of the emblematic, enormous Pummerin bell for a total of three minutes. High-Gothic Expansion: During the early 14th century, King Albert I commissioned a three-knave choir in the Gothic style, further expanding the then-parish church and adding sumptuous details that remain to this day. Other monarchs continued the expansion throughout the late medieval period, progressively replacing the old Romanesque elements until the entire former edifice had been transformed. New towers and vaulting were completed in the late 14th century. Remodeling and reconstruction work continued on the exteriors and interiors alike through the Baroque period (17th and 18th centuries). Establishing the Vienna Diocese: The parish church was transformed into a Cathedral and became the seat of the new Diocese of Vienna. It was established formally in January 1469, with St. Stephen's Cathedral designated as its mother church. In 1722, under the command of Pope Innocent XIII, it became the seat of the Vienna Archbishop. World War II and Beyond: As World War II was drawing to a close and Nazi-occupied Vienna was under siege by Allied troops, the Cathedral was spared from destruction when German Captain Gerhard Klinkicht apparently disobeyed orders to "fire a hundred shells" at it, which would completely destroy it. Nevertheless, fires from nearby riots eventually reached the Cathedral, causing its roof to catch fire and collapse. Unfortunately, some of the most ornate choir stalls, dating to the late 15th century, could not be salvaged. Shortly following the end of the war, St. Stephen's was rebuilt once again, reopening fully in 1952. Its present-day guise, including the colorful imperial rooftop tiles that give the Cathedral its distinctive appearance and date to the Habsburg dynasty, has not changed tremendously from the mid-20th century. There's a lot to see at St. Stephen's, so it's essential to plan adequate time for your visit. If you wish to focus on only the main interiors of the Cathedral as well as the facade, budget an hour; for a full guided tour that includes the towers, catacombs and reliquaries, budget two and a half hours. The Facade and Four Towers: The imposing height of the Cathedral easily catches the eye, even from relatively far away. As a medieval seat of the Vienna Diocese, this grandeur was both willful and symbolically important. Admire the flamboyant Cathedral's four tall towers from different viewpoints. Then, climb up the towers for remarkable views over the entire city, especially from the South tower since spire reaches the highest point in the city at 136 meters (446 feet). Try going on a clear day for the best vantages. Take note of the colorful, unusually bright tiles that decorate the rooftops. Numbering an incredible 230,000, these come together to form a mosaic pattern in the shape of Vienna's coat of arms, as well as the Imperial double-headed Eagle that emblematizes the Habsburg dynasty. The rooftops themselves are dramatically steep, lending additional grace and unusually sharp lines to the facade. The Bells: The towers house 23 bells, and some of them are the most beautiful and elaborate in Europe. The grandest of these by far is the Pummerin bell situated within the North Tower. At just over 44 pounds in weight, it's the second-largest chimed church bell in Europe. The Interior: The ornate interiors greatly reflect a period of Baroque renovation during the 17th century, melding with earlier high-Gothic elements from the Cathedral's medieval period. Altars: There are over 40 of these throughout the church, including in numerous chapels. One to focus your attention on is the High Altar, built in the mid-17th century. Representing the stoning of St. Stephen himself, the altar is decorated with figures of many other patron saints. The Wiener Neustädter Altar is also beautiful and worth admiring. It dates to the mid-15th century and was commissioned by the Emperor Frederick III; he was laid to rest in the Cathedral and his tomb can be visited there. The Pulpit: Make sure to take time to admire the decorative stone pulpit, considered by many art historians to be a masterpiece of the late Gothic period. Each of the four saints on the pulpit represent a different temperament and phase of life. Other decorations on the pulpit include carvings of lizards and toads engaged in a battle between good and evil. Under the stairs of the pulpit, you'll find one of the Cathedral's most-emblematic figures. Known as the "Fenstergucker" (window-gawker), the statue is ostensibly a self-portrait of the sculptor who created the pulpit. The Chapels and Reliquaries: The Cathedral boasts many ornate chapels and reliquaries. Among the most beautiful and important include the St Katherine's Chapel, located at the base of the South Tower. Here, statues of four evangelists in marble can be admired, as well as figures depicting the twelve apostles, Jesus and, of course, St. Stephen himself. The Chapel of the Cross, meanwhile, harbors the tomb of Prince Eugene of Savoy; a vault here holds three coffins and an urn containing his heart. It was here that a funeral for the composer Wolfgang Amadeus Mozart was held in December of 1791. The chapel is unfortunately not open to the general public. St. Valentine's Chapel, located just above the Chapel of the Cross, holds the Cathedral's main reliquaries, or objects of sacred religious importance. Hundreds of these are deposited here; more important relics include a piece of the tablecloth thought to have been used during the Last Supper with Christ. The Catacombs: The Catacombs underneath the Cathedral are fascinating and can be visited as part of a guided tour. Since St. Stephen's was built atop Roman and early medieval cemeteries and itself has served as a crypt for numerous centuries, visiting the subterranean part of the Church is a way to truly step back in time. Notable tombs inside the catacombs include ones holding the remains of the Holy Roman Emperor Frederick III, the Prince Eugene of Savoy, and the "Ducal Crypt," which holds the remains of numerous members of the powerful Habsburg Imperial clan. The catacombs are also interesting for their connection to the bubonic plague of 1735—the bones and skulls of some 11,000 people are buried within. Most guided tours allow visitors to see some of these remains, which are a morbid but fascinating sight. Vienna is a historic center for classical and choral music, and St. Stephen's has a long legacy in this arena. The composer Haydn once sang in the choir here, and Mozart was married at the Cathedral. Anyone with an interest in classical and choral music should consider attending a concert or musical service while in Vienna. See this page for more information on upcoming concerts and events. The Cathedral is open year-round, Monday to Saturday from 6:00 a.m. to 10:00 p.m. and on Sundays and public holidays (including New Year's Day and Christmas Day) from 7:00 a.m. to 10:00 p.m. Entrance to the main areas is free, but taking a paid guided tour is strongly recommended to fully appreciate areas that are otherwise inaccessible to the general public. These include the catacombs and crypt (which hold remarkable tombs of bishops and members of the Habsburg imperial dynasty), the South and North Tower, and restricted areas with precious objects of art and reliquaries. Visit the official website for complete information on guided tours, current prices, and times. Certain areas of the Cathedral, including the main entrance, are wheelchair-accessible. Others, including the towers and catacombs, are not. If you're a potential visitor with limited mobility, you can find more information at this page. The Cathedral is located at 3 Stephansplatz in central Vienna, on the large and vibrant square that shares its name. The closest U-Bahn (Underground) station is Stephansplatz (Line U3). For more information about planning your visit there, check the official website or the Vienna Tourist Information Office. St. Stephen's is in close reach of numerous important sites and attractions in central Vienna. These include the Jewish Museum, an important site of history and memory in a city that saw some 65,000 local Jewish citizens deported to death camps during the reign of Adolf Hitler. Stephansplatz itself is also worth admiring as one of Vienna's largest squares, and it's situated in the very center of the city. Make sure to window-shop or embark on a shopping spree on the wide street known as the Graben; Karntner Strasse is also well-known for its lovely, numerous boutiques and shops.